It seems like everyone is getting into blockchain these days. After all, companies claim to like “transparency,” “security,” and anything to do with the rollercoaster ride that is bitcoin. But consider this: tuna. There are now several blockchain-based projects that aim to stop illegal tuna fishing, according to a post on The Conversation by Candice Visser and Quentin Hanich from the University of Wollongong in Australia. The idea is that blockchain-verification would assure consumers and others that the fish were ethically sourced. Or maybe it’s just PR, who knows. 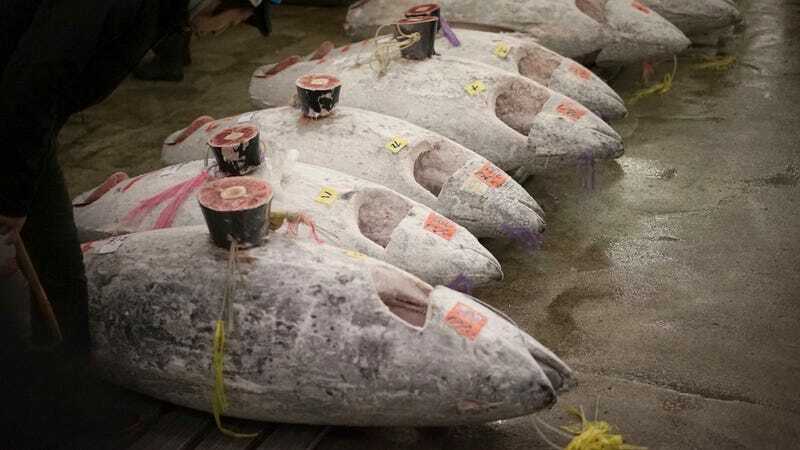 The [World Wildlife Fund] pilot project will use a combination of radio-frequency identification (RFID) tags, quick response (QR) code tags and scanning devices to collect information about the journey of a tuna at various points along the supply chain. While this use of technology is not new for supply-chain tracking, the exciting part is that the collected information will then be recorded using blockchain technology. Tracking will start as soon as the tuna is caught. Once a fish is landed, it will be attached with a reusable RFID tag on the vessel. Devices fitted on the vessel, at the dock and in the processing factory will then detect the tags and automatically upload information to the blockchain. That means that consumers would be able to see the history of their tuna, and easily check if it’s been legally fished. The WWF is not the only ones doing this. Visser and Hanich point out that a company called Provenance is using blockchain to trace tuna from Indonesian fisheries for British consumers. Provenance also tracks cotton, coffee, and other things. There are companies using blockchain in agriculture. You can Google “blockchain [noun]” and find someone working on something blockchain related. But here’s the thing: tuna. I reached out to the groups involved for a comment to see how legit this is, how well Provenance’s pilot went, whether this is just a PR stunt or if there’s a plan for expanding it, and what some of the downsides are—we’ll update the post when we hear back. Visser and Hanich point out that eventually the RFID tags might prohibit small operators from taking part in the project. I feel like tuna getting on the blockchain means that this tech is old news. You know, like your grandparents getting a Facebook. What&apos;s the Blockchain, and Why Does Bitcoin Depend On It?